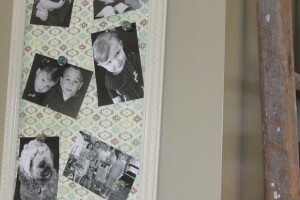 Making a magnetic memo board is as easy as can be. 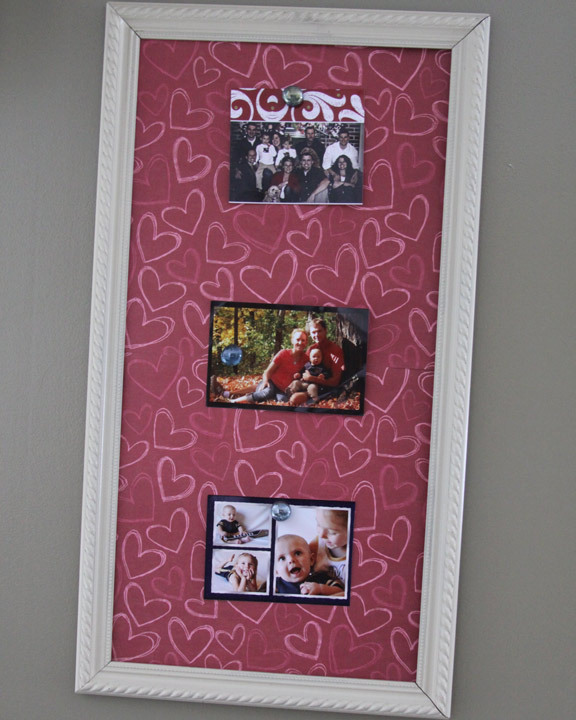 An old frame, sheet metal, and some scrapbook paper can instantly become a simple and useful piece of home decor. 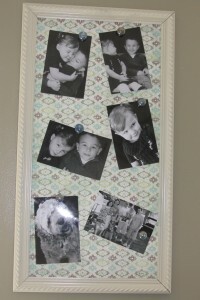 If you find the right sized picture frame it can also be interchangeable. This board is the perfect place to display your newest family photos, cards from family and friends, or important dates and notes. I love using our magnetic board to display import things. For holidays and birthdays it is filled with cards and letters from family and friends. If we have important dates or activities I often leave a little note on the board so it is not forgotten. 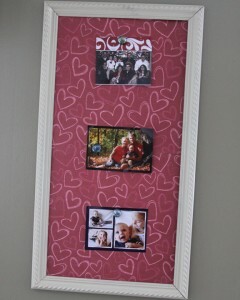 If there is nothing in particular on the board I love to display my newest pictures of the kids that I have taken. This board is so easy to make and takes only a few supplies. It is so useful and pretty that you can hang it in any room of your house. I was lucky enough o find a frame that had the exact dimensions of two pieces of 12 x 12 scrapbook paper. While I was deciding which paper I liked best (before I attached it for good), I found myself loving the fact that I could change the paper out for holidays, and different seasons. So our board became interchangeable, and I love the versatility of it. It also cuts out another step in creating this board and makes it an ultra easy and quick project. Do you remember my dry erase menu board that I showed you a while back? Well this frame was a matching frame that I bought at the same time. The set of two frames ran me about $8.00 at the Habitat For Humanity Restore in our area. I wanted the two frames to be in our kitchen/dining room are, but didn’t necessarily want the to match perfectly. I opted to paint this $4.00 frame in an off white instead of black like the other frame. To start this project I took the frame’s components apart and removed the glass. I painted the frame off white and while it was drying cut my sheet metal. You can purchase sheet metal at any hardware store. I believe you can ask them to cut it to size for you too. My hubby uses sheet metal for work so I always run out to his shop and “borrow” some scraps. I use a tin snips to cut it in the size that fits into my frame 12 x 24. I used the cardboard backing that was in the frame to trace the dimensions onto the sheet metal with permanent marker before cutting. Basically the sheet metal will be the size of the “picture” that you would put in to the frame. The dimension of my finished frame are 14 x 26. The picture size is a perfect 12 x 24. The exact dimensions of two large pieces of decorative scrapbook paper one on top of the other. At this point if you wanted your board to not be interchangeable you would add a thin coat of Modge Podge to your sheet metal and lay the scrapbook paper carefully over it and let it dry. Instead I decided I would like to be able to change the paper out, so I skipped that step and reassembled my frame with the scrapbook paper just laying on top of the sheet metal. 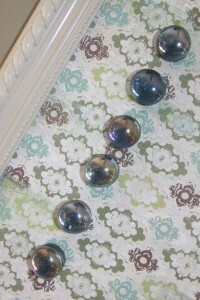 It tucks in perfectly behind the frame and the magnets help keep it in place once it is hung on the wall. I love that we can easily change the paper for the holidays, or special occasions! I also had some plain black magnets laying around that I found at Hobby Lobby a while back and some decorative blue stones from a floral arrangement that I made into pretty little magnets to match. All I did was hot glue the stone onto the little round magnet, and I had some simple magnets to use on my new memo board. This is a fast project that anyone can do. It is a very useful piece of home decor that can be personalized to fit your style. 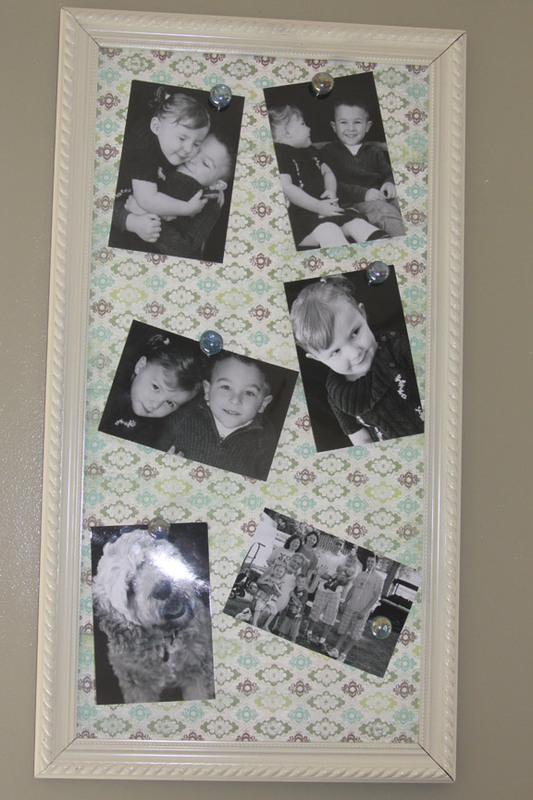 This magnetic board would also make an excellent gift to give to just about anyone! The possibilities are endless. This could be perfect for an office, nursery, man cave, kitchen, anywhere depending on your paint, and paper choices. Re purpose and old frame into something useful and beautiful!